"I noted that me sense of direction is better at sea than on the land. A few minutes back we had landed on this glitzy island of fun. But we were completely lost in the landlubber's paradise. I asked me men to spread out into different directions and locate our destination. As they dispersed, I along with one of me mateys walked in our chosen path. I saw a strange sight in the distance. It was a map made out of paint cans. And then it hit me, 29 is the number of states in India. This strange place had to be our destination." "All aboard the Indian Super Express." That was literally the first thing I could think of when I entered 29. It being a really long and narrow community hall, I could feel that I was inside a train of some sort. The restaurant was brand new at the time of my visit. It still had some smell of the newly done paint job. 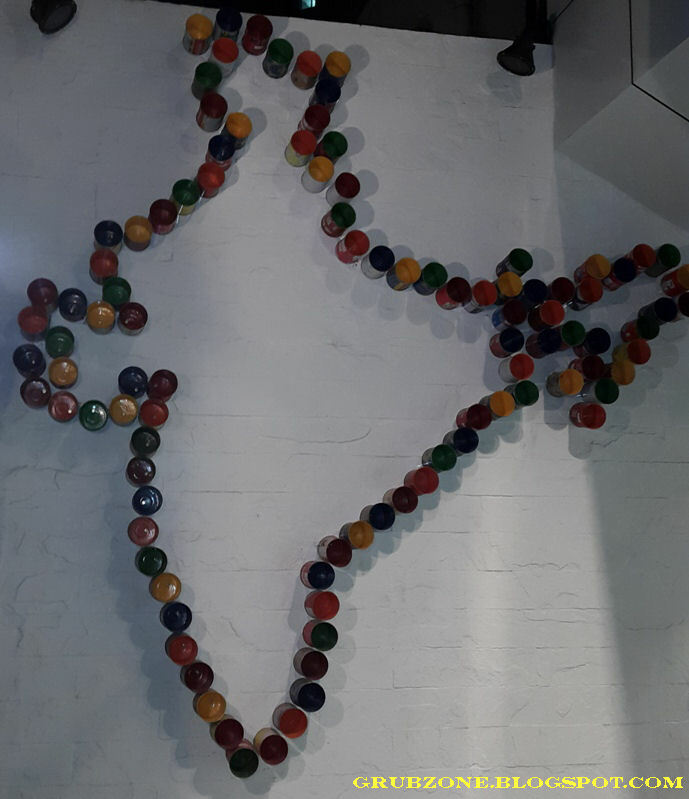 And if that wasn't intriguing enough, the owner Nishek Jain told me that depleted paint cans from the restaurant's paint work were used to make an outline of India at the entrance. 29 sports a simple ambiance, apart from the train like feel. The tables mimic those used in small town restaurants and the decor has a very spartan feel to it. There are two lanes as evident from the pictures with differently done walls and ceiling lights on both sides. 29 literally mixes a city restaurant with a dash of small town culture. A visibly tired Nishek(Getting a newly done place into service) was looking like a server himself. And the bloke was actually proud of it. He explained how he desired to bring the food of the twenty nine Indian states under one roof. Great Emperors have failed in bringing it all under one roof, could Nishek achieve what they couldn't? There were some hits and some misses with 29's food. The place has a long way to go before it becomes a popular mainstreamer but it certainly had spirited beginnings. Nimbu Paani - This was supposed to be a lemonade but I felt that it tasted more like a Jaljeera (cumin spiced water) drink. There was Jaljeera present in it and it overpowered the lemon's sour. I actually think this was a communication error. 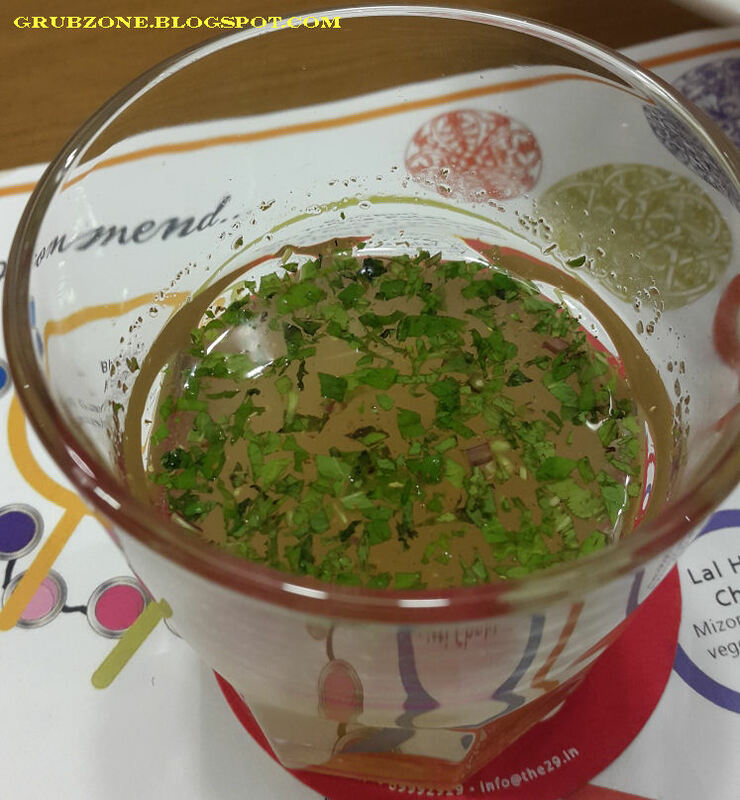 Jaljeera is usually used as an appetizer in Indian cuisines and this drink did a great job of that. 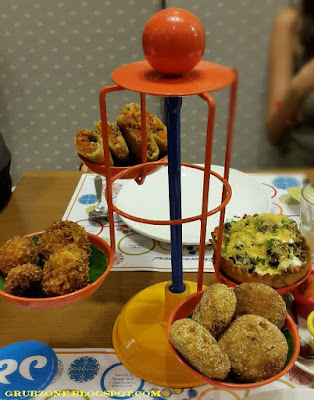 Following up next was the Four state platter served in a fancy and interesting way. Let me close in on each of the passengers. Captain : Lets spin tis' thing and pick one of each. Crewmate : What about the Dilli Chaat Cappy? There is just one of that. Captain : I will spin first. The chutneys served with the platter. 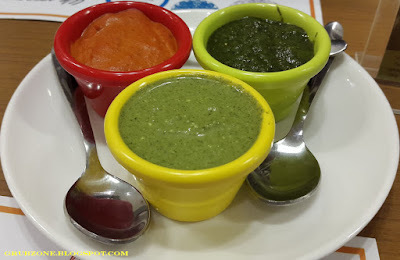 There is mint, Sanmeholi and Tomato paste. 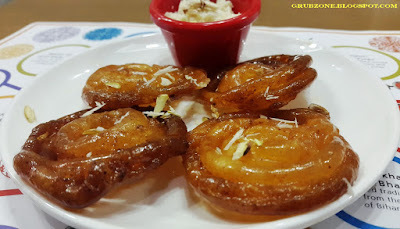 Potato chops with Assamese Sanmeholi Chutney. 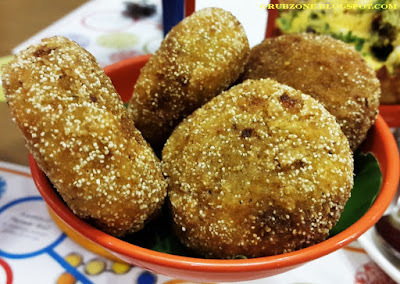 These tasted like soft potato cutlets with some onion and garlic thrown in. This complimented very well with the Sanmeholi Chutney which literally translates to mixed green chutney. The chutney is made out of garden herbs and chilies. This could make a great snack. 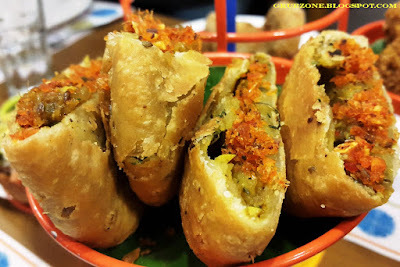 Dilli Chat is a mix mash of Samosas, crunchy poppadoms, Namak Pare(Salty Indian fried snacks) and pakodas. 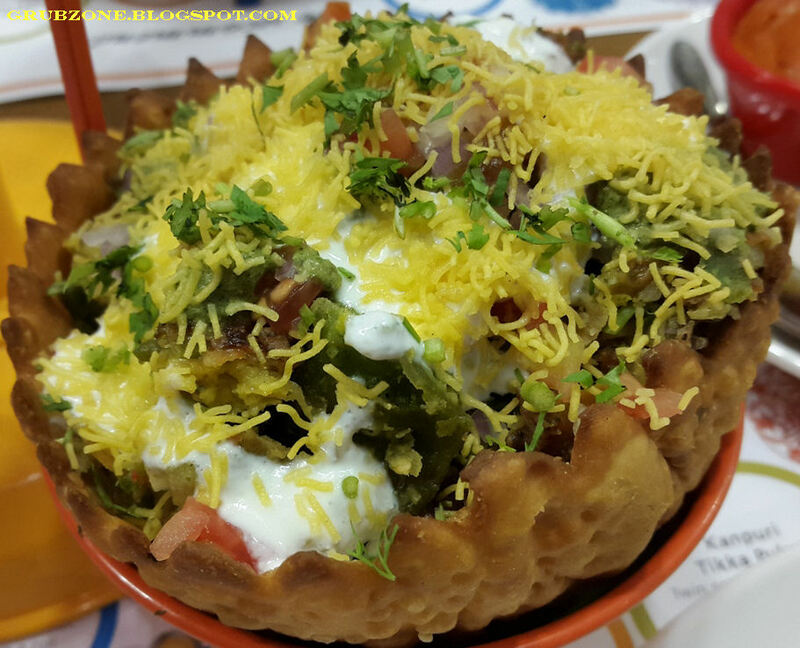 It was topped with sev and curd. Visibly, it does emulate Dilli chat with that edible basket bowl. It had the right amount of savory as well but what I felt was lacking was the right amount of chatpata. It lacked the spicy tangy kick that was expected of it. And the basket had a blistered texture which could be a turn off to food photographers. Bharwan Khumb is one of the few known mushroom based Indian delicacies. I have usually associated this with the frontier Punjabi cuisine though its billed as Garwahli(Mountainous Uttarkhand State) delicacy at 29. This is usually supposed to be made of the Khumb mushrooms which may resemble button mushrooms. The mushrooms were apparently stuffed with spices, a bit of cheese and fried with a batter coating. Truth be said, I felt that the flavor was insipid. I could not sense the stuffing. And the batter coating seems to be atypical to this dish. It robs the dish of its naturally soft textured appearance. 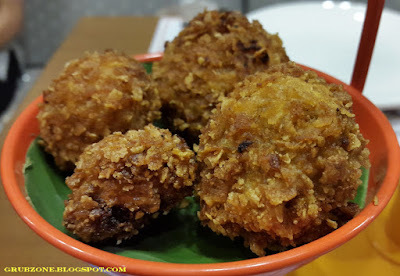 Jodhpuri Pyaz Kachori (Jodhpur's fried Onion dumplings) was a delicacy from Rajasthan. This was the highest point of the four state platter. Figuratively and literally(It was at the highest position of the serving contraption) both. The outer shell was made of flour mixed with semolina, carom seeds and milk. It had more flavor depth than samosa like deep fried dumplings. The stuffing was made of potatoes, onion, peas with spices and seeds. The appearance was not only colorful, befitting of the foodporn tag but the flavor was like a book in which each page was a separate story. Several shades of savory and salty entwined into a masterpiece that tantalized the tongue. Mizoram Lal Hara Chaat was more than lal hara(Red Green) with a significant amount of Peela(yellow) as well. This was served as a palate cleanser but eh it had too much of a flavor of its own. This tasted exactly like the sprouts-gram salad that I have at home which I admittedly am not too fond of. Dalimbichi with Usal ani Arbi Amti The dish was as difficult to capture on camera as its pronunciation. But it was quite a soulful dish. The sweet and sour colocasia(Arbi) curry had the flavors of rural Maharashtra. 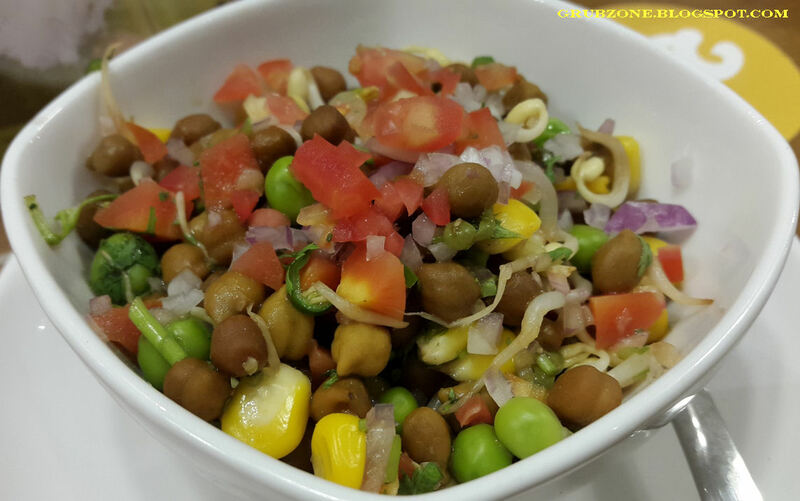 The dry field beans(Usal) tasted earthy and were great when mixed with rice and the curry. This may be a simple looking dish but the flavors speak volumes. Captain : I can never pronounce tis' right but I still love it. Crewmate : Maybe you should have brought along the linguist to remember it. Captain : We have a linguist?!! Crewmate : Somehow I feel you have said that before. Kashmiri Paneer Rolls were a vegetarian avatar of the famed Kashmiri meat Rolls. The rich red gravy inside and the bread seemed to be an accurate emulation though the paneer felt a little too big. 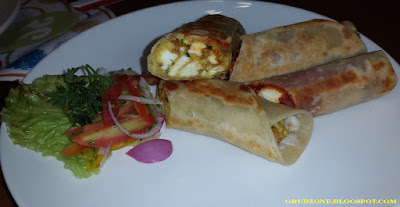 The flavor had not wrapped well around the paneer. Methinks this would have worked better with smaller cubes or minced paneer. 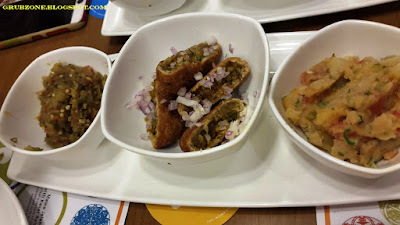 Litti Chokha with Baigan Bharta - Litti Chokha is literally stuffed bread eaten in the states of Bihar and Jharkhand. Though its mostly stuffed with minced meat, a purely vegetarian variant is quite popular too. The breads here were well cooked. Too well cooked actually. A little blackening would have helped it gaining a smoky rural flavor which is very much enjoyed in the North (This is an actual practice). The stuffing was flavorful with minced greens and spices. The breads and mashing went really well together. The Baigan Bharta (Cooked Aubergine) however felt a bit out of place though that could be due to my personal dislike of the bitter vegetable. The breads should not have bisected before serving. That would have helped retain the internal aroma which largely escaped by the time the dish reached the table. 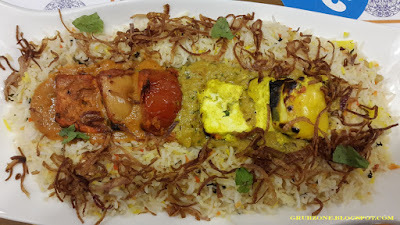 Kanpuri Tikka Pulav was a delectable rice preparation. I wouldn't know how much influence did Kanpur actually have in it since the flavor resembled a vegetable herbed pulav found at many places in Mumbai. The only element that could perhaps have been from Kanpur city were the twin paneer add ons. The Spicy red paneer tikka and the makhani yellow versions faced each other in some sort of duel over the rice. These cheeses independently tasted great though they appeared like post work additions hence played very little influence on the rice itself. I felt that there was a lack of diversity in the desserts served. One could find twenty nine desserts in twenty nine states but I cannot seem to bring myself to sing paeans about what was served to us. 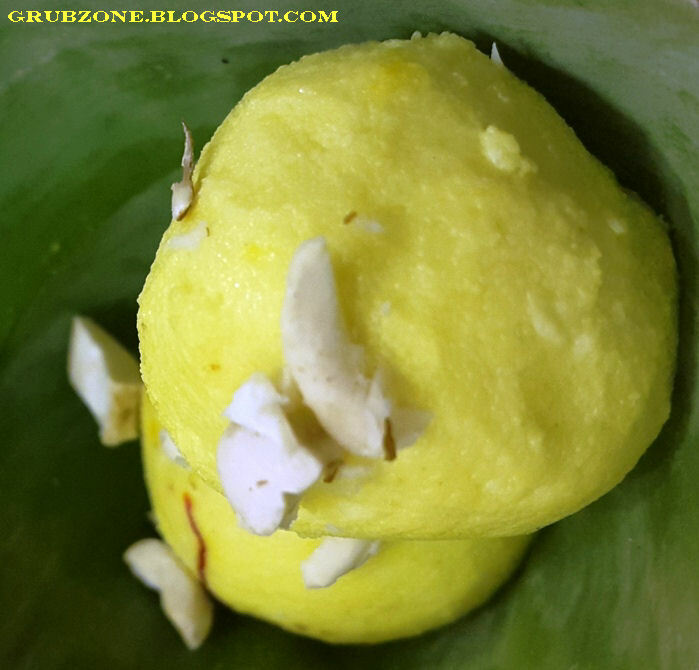 Kesar Malai Ke Ladoo were fragrant, soft and spongy dumplings with little sugar and had a saffron flavoring. These felt incredibly light and pleasant flavored. Would be quite the treat for those with low sugar tolerance. Captain : This be a soft affair. Crewmate : Tasty affair too. Captain : Wait a minute, did ya eat all of them? Crewmate : Sorry Captain, I could not hold meself. Captain : Guess who is getting Deckswe...no toilet scrubbing duties this week. Mawa Jalebi with Kesar Rabadi had a remarkably different color and texture from the everyday street side Jalebis that I am used to. These were made of flour mixed with Mawa(Reduced Milk) and fried in good quality oil before being bathed in the sugar syrup. The taste seemed to mimic regular jalebis. But it had a better aroma. These were served with saffron infused Rabdi which I could not get to taste. The service has a lot of room for improvement. There were a lot of teething issues and the desserts were delayed by quite a bit. The servers need to know about the vast array of dishes or at least have cheat sheets. They were clueless on many of the dishes. Their demeanor however was good and the crew was polite. The Pricing seems fair for the portion sizes served. It is the kind that encourages patrons to come again after a good experience. 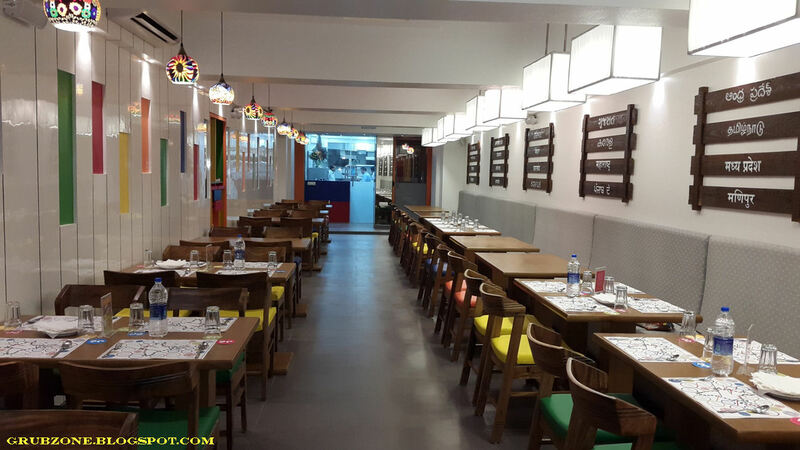 The food felt like an eclectic mix of cuisines from all over India. I think the essence of this place truly comes out when one orders stuff from one region instead of many. Ordering from many different regions tends to make a person feel that there isn't much diversity. Its simply a case of a palate suffering from several cultural shocks in a short period of time. One should stick to one or two states instead of several. So the place is worth several trips and each time a different experience can be lived. In fact, one could even sit under the certain state nameplates and order food from those regions. Sounds like an interesting idea. "Some done, many to go. We will ride our sails and come back to this place some day again."